U.S. Navy submarine commander Peter Vornado is at the top of his game in underwater warfare when a devastating illness takes him out of the service and almost to the grave. Without duty, honor, or something to fight for, his life is as good as over. A terrorist cabal has acquired a scrapped Soviet sub from the Cold War -- a technologically advanced failure still able to outrun any torpedo or enemy vessel and strike at will. With a nuclear payload, it will enable them to strike directly at Israeland throw the world into chaos. All that remains is to modernize the sub with the latest technology. Order EMERGENCY DEEP At Amazon.Com! Order EMERGENCY DEEP At Amazon U.K.! The upcoming release of the first book in the new trilogy from Michael, entitled, EMERGENCY DEEP. 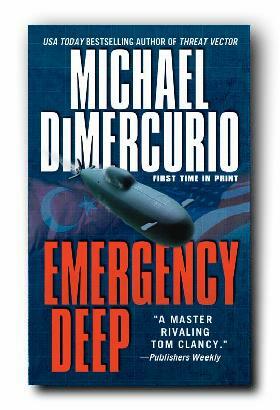 Emergency Deep is a complete departure from the Pacino novels and is set in today's world, with today's technology. After reading this book it seemed clear to me that Michael wanted to break away from the almost sci-fi weaponry and settings of his previous works and concentrate on a new cast of characters using current, yet still remarkable technology, while painting a picture of things that could happen now, in the present. In Emergency Deep, Michael digs deep down into a man's soul and asks very relevant questions that tear at the heart and brings us closer to our own humanity. The main character, Peter Vornado, is faced with life and death decisions, both personal and professional and is forced to make choices that no one wishes for, not even on their enemies. I loved Emergency Deep because it not only took me on another thrilling adventure inside the bowels of a nuclear attack submarine, but also because of the richness of its characters with all their frailties, needs, hopes and dreams. I'm not ashamed to say that this book made me cry and it made me examine myself and wonder what I would do if faced with such extreme adversity. This is not to say that Emergency Deep is a morbid tale that left me with feelings of loss and despair. No, not at all, but rather I was deeply moved at how skillfully Michael wove tear-jerking moments into an action-packed adventure story. I also sensed what I considered an inside look into Michael's mind, as he might have struggled in real life during his own naval career. There are parts of this book that I truly believe could not have been written without first-hand experience. Many of you may be sad that the "Pacino" series is over, but I humbly submit that you will love this new storyline and marvel at its complexity of personal pain, triumph and technical wonder.